Legacy products are no longer in normal production. Consult factory for availability. We recommend current series Guardian or Slimkool as possible alternatives. Rating shown is for operation at maximum ambient temperature. 230V models with Short Cycle Protector are not RoHS compliant. 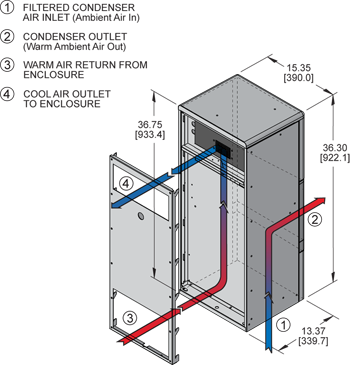 Built-in Condensate Evaporator eliminates need for draining condensate under normal operating conditions. May not be adequate in extremely high humidity with open or leaky enclosure. Overflow condensate drain fitting and hose are included. 120V or 240V heater attached to the compressor crankcase to maintain appropriate temperatures during cold operating conditions. All KOOLTRONIC filters consist of a multi-layer grid of sturdy corrugated aluminum, securely held in a one-piece aluminum frame. Filters are required wherever air is drawn into an electronics enclosure or related cooling equipment to keep internal parts as clean as possible. A non-drying adhesive coating traps a high percentage of particulate matter. These filters are reuseable, they may be washed and recoated with the appropriate filter recoating adhesive. Replacements are available for those which become damaged or otherwise non-serviceable. A control device to minimize compressor cycling and prevent evaporator coil icing. Electronic Thermostatic Low Temperature Control prevents over-cooling and provides energy-efficient operation. All units are fully gasketed for tight, leakproof installation, in compliance with the NEMA 12 and 3R Enclosure Ratings. Where light weight and/or compatibility with appearance of aluminum enclosures are required. Unpainted Type 5052 is standard. Other types and ultraviolet-resistant baked powder finish are available. Available as a Standard Feature on models with Programmable Thermostat. Protects the compressor from possible damage due to harmful short cycling, (frequent starting) where temperature controls enable the compressor to restart frequently or after a power interruption. These conditions could be due to low or fluctuating heat loads within the electrical enclosure or a power failure. The Compressor Short Cycle Protector will prevent the compressor from starting when it has been shut off for less than several minutes or the power was interrupted. By limiting the number of compressor starts per hour, the life of the compressor is prolonged. It is recommended where installations are subject to solar gain and or changes in the enclosure internal load due to the degree of usage of the equipment being cooled. It is also recommended where higher capacity units are specified in anticipation of the future addition of heat producing equipment being added to the enclosure. 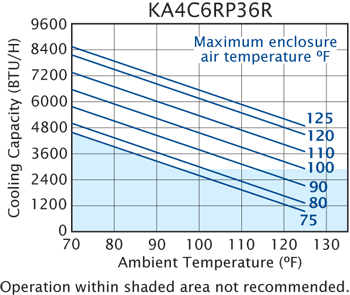 Eliminates damaging condensation, increasing reliability of electrical enclosure components. This compound is a superior product for recoating filters after washing. The adhesives penetrate dirt layers to keep the filter surface tacky for longer effective performance between washings. This protection increases reliability in hostile environments. This protection for the refrigeration system consists of an air cured coating applied to the brazed joints on the condenser side, providing a degree of protection from corrosive environments. This coating will withstand 1000 hours of salt spray per the ASTM B 117 test method. 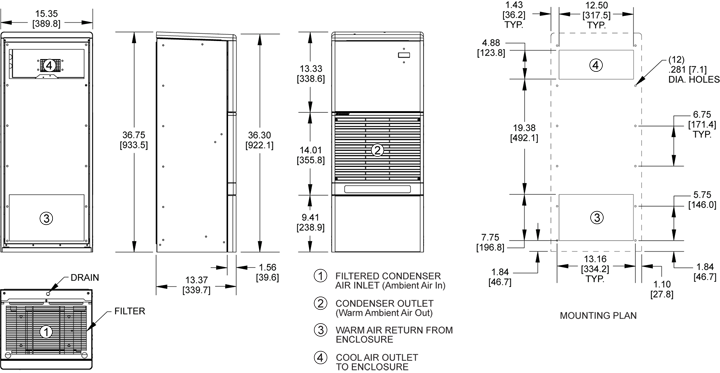 Also see Stainless Steel Cabinet or GuardianX Air Conditioners. NOTE: Severe operational environments such as waste water treatment and salt spray are likely to cause corrosion failure over a period of time regardless of coating. Warranty: Corrosive conditions may affect the warranty coverage. Consult factory for warranty limitations in corrosive environments. NOTE: For additional corrosion protection options, contact factory. 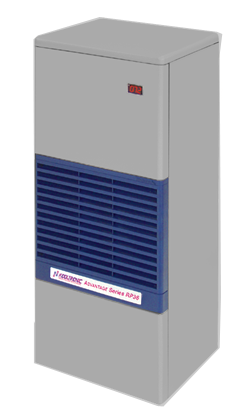 Used only with a user-installed remote thermostat or the Kooltronic KLLC100 Lead Lag Controller, this 24VAC relay can be used for the sequential operation of two units or with a single unit. An external terminal strip is provided for field interconnection. NOTE: User-installed thermostat must have a set point of 75°F with a differential of 11°F. NOTE: A factory installed thermostat is not provided with this option. All KOOLTRONIC filters consist of a multi-layer grid of sturdy corrugated aluminum, securely held in a one-piece aluminum frame. Filters are required wherever air is drawn into an electronics enclosure or related cooling equipment to keep internal parts as clean as possible.,A non-drying adhesive coating traps a high percentage of particulate matter. These filters are reuseable, they may be washed and recoated with the appropriate filter recoating adhesive. Replacements are available for those which become damaged or otherwise non-serviceable. A thermostat is mounted inside the cabinet and attached to a sensor in the warm air return. When the air temperature increases to the set point, a signal is sent to a terminal block. User-installed wiring from the terminal block to local and/or remote warning devices (light, bell, siren, etc.) can be for normally open or closed operation. * UL/CUL Listed models are available at added cost. For RP36 models the filter part number is 9121F. Many popular units are available as 3D solid models for customer system integration. Contact Kooltronic for details. Dimensions, inches [mm], are for reference only and subject to change. *See model specifics for drawings, dimensions, mounting or cutout plans. © 1996-2019 Kooltronic, Inc. - All rights reserved.